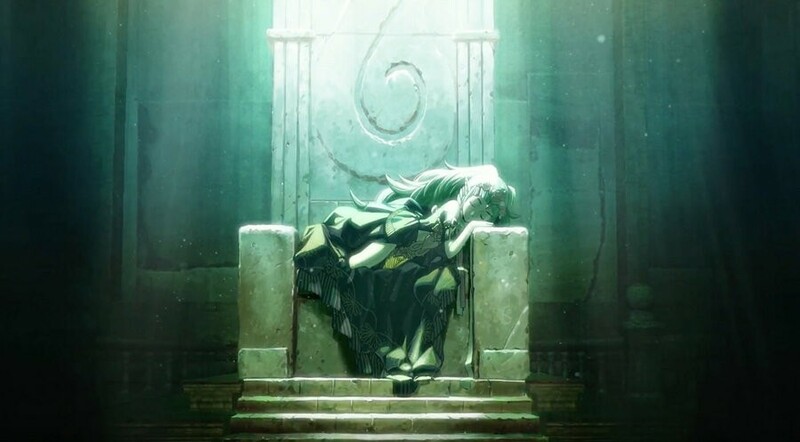 The upcoming Fire Emblem: Three Houses may have been delayed until September this year, if a recently updated retail listing is to be believed. The latest official word on the game's release date, shared during a financial report just a couple of weeks ago, said that the game was still on track for a 'Spring 2019' launch. That would mean we can only be a few short months away from having it in our hands, but we've seen very little in terms of footage or information so far. Is it really that close to completion? Has Nintendo really just been holding everything back? 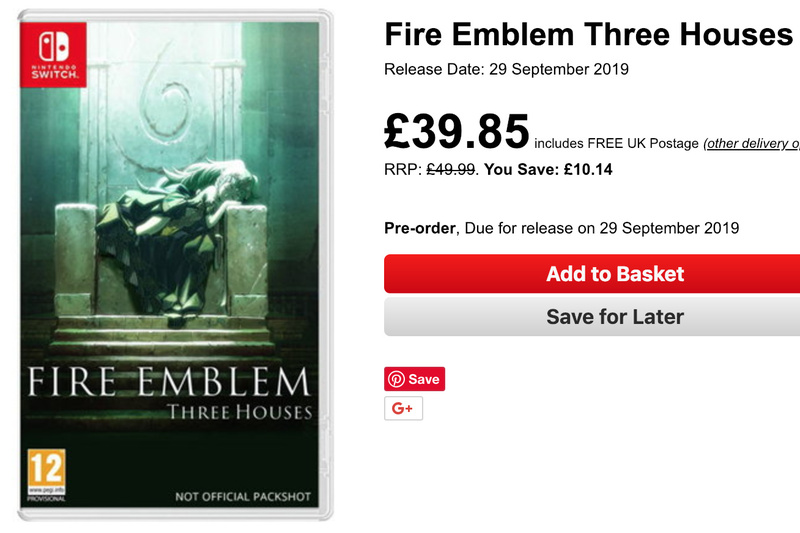 Well, while that could absolutely be the case, a UK retailer has very recently updated its product listing for the game, suggesting that it will actually be arriving on 29th September. It's worth noting that the retailer in question is Base.com (who also recently shared some oddly specific release dates for Animal Crossing, Luigi's Mansion 3, and DAEMON X MACHINA) and that the listing update has been implemented at a time suspiciously close to the reveal of a Fire Emblem-focused Nintendo Direct. As always, make sure to treat this information as speculation for now - we're sure we'll learn more about the game's release date during the Nintendo Direct later today. If you're hoping to watch the show live, make sure to pop back to Nintendo Life for the big event at 10pm GMT / 11pm CET / 2pm PST / 5pm EST for our livestream coverage. Do you think a minor delay like this is likely? What are you hoping to see from the Fire Emblem portion of today's Direct? Comment away down below. Really wouldn’t surprise me I feel they haven’t shown the game off enough for a spring release, don’t think it has issues like Metroid Prime 4 just think it needs some more polishing. Fire Emblem hasn’t always worked out on home consoles so I’m sure they want this to be a hit. If they don't enough big games for the year it makes sense to hold the biggest ones back for the holidays. So the 13th AC and the 29th FE? I know two very different games but dont nintendo space out these big names throughout the year. The owner has a cousin that works at Nintendo. Well, I suppose we'll find out if this rumour is true or not tonight. Didn't the Pres say no more delays or something recently ? It makes zero sense to focus a Direct on a game releasing seven months from now. I’m guessing spring still. That doesn’t sound at all likely. AC and FE within 16 days of each other? FE releasing on a Sunday when every other first party retail game has been Friday? A spotlight on FE tonight but not all the other games that would be releasing earlier according to their own listings? I doubt it. if that was the case it wouldn't be the main focus on the direct. i expect it to come out At least May, no earlier than June the latest. Nintendo games NEVER been released on Sunday. It always on.... Last Friday Night. I forgot what its window even was anyway. I really doubt that Base.com have any more of a clue than the rest of us though and the fact that it's a Sunday means this exact date is 100% wrong. The fact that it's the focus on the Direct probably hints towards the initial release window being more accurate. We'll find out soon enough. It would be weird for them to have now a presentation that includes FE only for it to be released in September. I think the idea of this Direct would be to show games that will come to the console in the first 6 months of the year. @Nintendolife always with Directs we get lots of rumors. Which are most commonly false. I would advise against posting any rumors before the Direct. yeah I'm not buying them releasing AC and FE so closely together. Either both or one of these release dates are wrong. They must have learned their lesson after Tellius. How can something that didn’t have a release date be delayed? This game has been "2019" for months now. I can't believe you guys are reporting on this now. I just doesn't make sense. Why would Nintendo tweet out that they are gonna talk about Fire Emblem if they are delaying it? Wouldn't it make sense to headline a different game? This feels quite random to report on just hours before the Direct. Let's see what Nintendo has to say. @sanderev I agree on that. @ninboy It was scheduled for Spring 2019 (even stated in the fiscal report very recently), but if Base.com is to be believed (though in fairness they have had a lot of wrong dates placed in recent times) the game is being delayed to Autumn 2019. Quite a big change to report on. Honestly don't know why they would report it as Spring 2019 in the recent fiscal report and not swap it to 2019 if they were going to delay it this soon after. Why focus on this in the direct if it won't be released until September? And how can it be delayed if it doesn't have a release date? Why am I reading this bit of "news"? @XenoShaun They listed "Spring 2019" on their Quaterly Report literally 2 weeks ago. 1) There's no way that they changed release date and some retailer has the info in 2 weeks; and 2) if they did this, then it could be seen as trying to deceive the investors. That would sink any company overnight. I don't see any kind of merit in this "rumor"
I don’t believe it for a few reasons. 2. The game is listed for Sunday, Nintendo first party games come out on Fridays. 3. The same site also has Metroid Prime 4 listed as a 2019 game despite the delay. 4. Nintendo doesn’t usually release their big games in the same month. They space out their releases. @MisterDevil @BlackenedHalo The date on the listing is a Sunday. Before Nintendo stated Fire Emblem Three Houses would be given a spotlight in today's Direct, I thought it would release in August because we heard nothing since E3 and that's a pretty normal delay sign (see Yoshi not appearing after E3 2017 for example). However it doesn't make sense to have Three Houses as a spotlight if it's releasing so late so I think either this release date is false and it's actually releasing in the Mario Tennis Aces slot (late June) or after Yoshi we're getting nothing but ports until September (not a bad thing but I find the release date being wrong being more likely). Delayed? I wasn't aware we had more than "2019" as an expected release. I know some people were talking about a spring release, but I thought that was just speculation. It’s time for a media blackout. Enjoy the Direct, everyone! Who's betting on a 10-minute LaxChris video on this? @Heavyarms55 Nintendo's recent investor meeting had it listed for "Spring 2019". Didn't he just say there wasn't more delays? Takahashi-san did state there were no delays planned for games scheduled for 2019 (during Nintendo's investor Q&A meeting), though I'm unsure if this applies to 2019 releases simply being pushed back further into the year. The Investor's meeting also had it pegged for a 'Spring 2019' release so I really hope that's the case. [Last week] No more delay from now on. [Then a few weeks later] Fire Emblem will be delay til Sept. Keep your word Ninty. 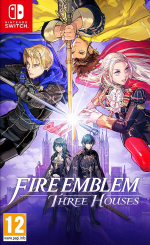 Please understand, Fire Emblem: Three Houses will launch exclusivley for New Nintendo 3DS Sunday 29th September in line with a special segment in Country File. Fire Emblem Three Houses is coming Spring. I doubt they’d lie to investors so close to a Direct about it. Regardless, we have yet to see whether this is true or false. No way Nintendo would make Fire Emblem the headline of the Direct, then say, oh btw, it's delayed. I don't buy this rumor. To everyone just saying it’s wrong because that’s a Sunday and Nintendo has never done that; as late as 2013, Nintendo still released games on Sunday. Yeah, they don’t anymore, but it was done in the past. That said, this doesn’t jive with the financial report. @Heavyarms55 The E3 trailer had Spring 2019 and every investor meeting after E3 has kept that release window. I actually expect there to be more shuffling due to Metroid Prime 4 being a no go for this year. I'm so spoiled for choice on the Switch, I find myself semi-hoping for delays just so I can clear up my backlog lol. @Peterjr1 I like hearing the rumors, just gotta make sure you don't get upset about a rumor until it's proven right. I don't buy this rumor at all. Nintendo games don't release on Sundays. I doubt Nintendo would choose this as the main pre-direct highlight if it weren't releasing for 6 months. That's very un-modern Nintendo of them. Though, even if there is a delay I doubt any retailers know the exact date. Most games releasing in the later half of the year get release dates close to or at e3. All that base are doing is chasing for clicks, £39 is a great price! It wouldn't surprise me if it were delayed, and Nintendo has proven in the past (even very recently with metroid Prime 4) that they will make the difficult decisions if it will benefit the game. I still remember the two year delay for Ocarina of Time! I love Fire Emblem, however with WarGroove I have an amazing alternative to keep me going until it is released. If it comes in Spring, I will buy it. If it is delayed, I will buy it. I'm not going to fret over a release date that hasn't even been confirmed yet. My actual feeling is that it will arrive in May. I hope I'm right!